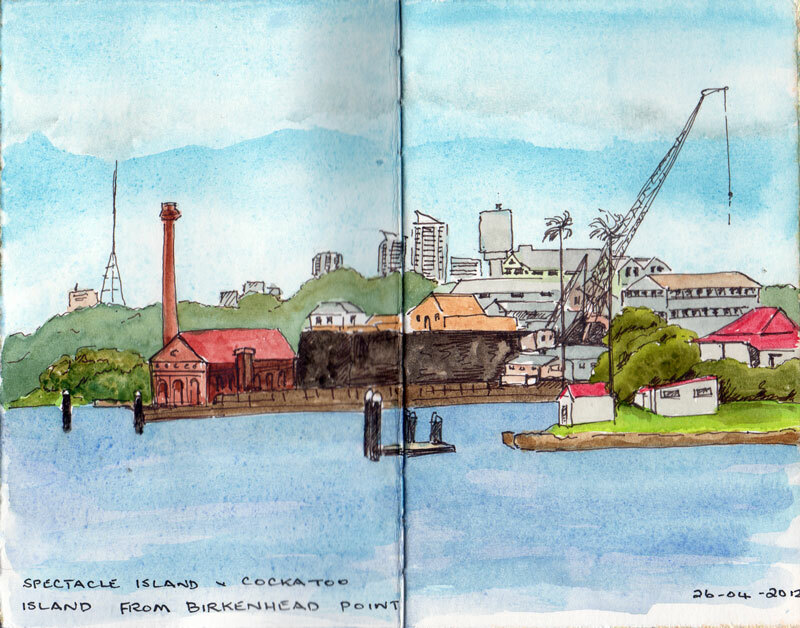 Birkenhead Point is a shopping centre that was converted from some old warehouses in the 80s. There used to be a pub where you could get a BBQ lunch and sit on the lawn & watch the view. The pub has long gone and there are blocks of high rise apartments everywhere blocking the view. The shopping is factory outlets, so we went over there looking for a few things and planning also to sketch. The shopping centre has been completely modernised recently and we had thought perhaps to draw inside. Unfortunately the shops were not of interest so we walked down to the foreshore where they have now made a long narrow park. 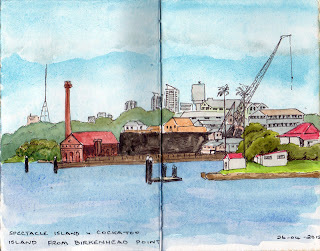 There is a marina on one side and just around the corner is this view of Cockatoo Island with Spectacle Island in the foreground. I've previously drawn this building, while on the island and also the drawing office, right at the top. And the cranes if course. So, a satisfactory day though NO new jeans and NO new sketching jacket. So what has everyone been sketching in May?